Both kids are sick, it's a long weekend and we are holed up in the house trying not to spread germs or drive each other totally nuts. Unlike during the week when I make myself crazy trying to get something that resembles dinner on the table so that everyone gets to bed at a reasonable hour (hello, school days), I now have some more time to try out recipes. As it turns out, I still loathe cooking even with all of the time in the world to properly measure out ingredients without worrying someone will fill up on veggie straws in the meantime. But the silver lining in it all is I had some more time to figure out the fun stuff, like snacks I can make for the kids since snack time is their favorite meal time, duh. 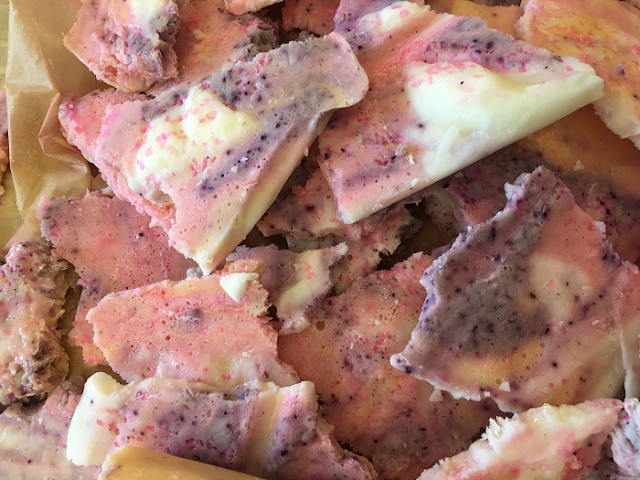 I made this unicorn bark without using any food coloring, just fruits. It was easy and fun -- except for the whole waiting-for-it-to-freeze part, which my six year old let me know was ruining his afternoon. I colored the yogurt by adding 2/3c of yogurt along with the fruit in the food processor. 2/3c yogurt + 1 handful blueberries, puree, pour into a bowl. 2/3c yogurt + 1 handful strawberries, puree, pour into a bowl, and so on. I added fruit until I got my desired shade of colors. Add each color yogurt one heaping spoonful at a time onto a cookie tin lined with parchment paper. Don't forget to add some plain vanilla yogurt for the white! Once your colors have all been added, use a knife or a toothpick to pull the colors together and marble them, a little. Add your sprinkles on top! If you want. Cover the tray in plastic wrap and pop it into the freezer for a while. Ours took about 40 minutes to get fully frozen. Once frozen, break the bark into serving-size pieces. Enter Key for office.com/setup, after purchasing Office from visit office.com/setup, sign in to your www.office.com/setup account then enter product key for Office Setup. Nice post! get step-by-step guide for office – activate, download & complete installation from office.com/setup and we provide antivirus free technical support, customer service & online support to activate antivirus and to install ms office ,get live chat help & support by just visiting mcafee.com/activate & norton.com/setup .